The Hayward pool heat pump from Juliano’s Pools is a self-contained unit designed specifically for pool heating. Each component has been selected with care to achieve a highquality product in an effort to exceed all industry standards. All Hayward pool heat pumps from Juliano’s Pools have an electronic board with service analyzer, a titanium heat exchanger tube warranted for 10 years against corrosion and a UV-resistant plastic cabinet that eliminates all maintenance for life. 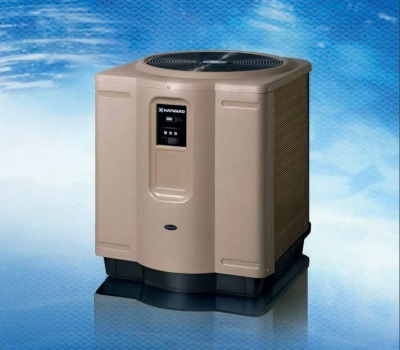 All components are of superior quality, which presents you with an effective, state-ofthe-art technology heat pump. Compared to other types of pool heaters, such as gas or oil-fired, the Hayward pool heat pump has a lower heating capacity on a BTU/hr basis. Therefore, it needs to operate for a longer time to accomplish the desired results. Occasionally, it may be necessary to run the heat pump for up to 24 hours per day. However, this should not be of concern to the owner because the heater is designed to operate continuously. What’s more, despite continuous operation, it will still heat the pool far more economically than other types of heaters. As with all pool heaters, you are advised to use a pool cover at night and when the pool is not in use. The pool cover should be used if night temperatures are 15°F less than desired pool temperature. This will keep evaporation, the greatest source of heat loss, to a minimum, thus greatly reducing the overall pool heating costs. During warmer weather, the pool cover may not be required. The Hayward Sumit XL maximizes energy savings while allowing you to specify the water temperature to within 1 degree. Tired of your noisey old pool heat pump? The Summit TL provides superior sound reduction that won’t wake the neighbors. Living in New England, we are prone to some drastic weather and temperature changes. The Summit XL provides years of durability in even the harshest climates.